Maddison Taylor who won first prize in Sittingbourne in Blooms' annual 'Design a Flower Bed Competition’ early this year had a preview this morning of the floral display which she designed. Accompanied by family members including her mother she was able to see first-hand the work undertaken by Blenwoods, the Council’s landscape contractor, who have faithfully recreated her winning design. For those wondering where this is located, the flower bed can be found just off the roundabout at East Street. This was selected as the new location for the competition after the roundabout in front of the train station became unavailable due to the redevelopment of the town centre. 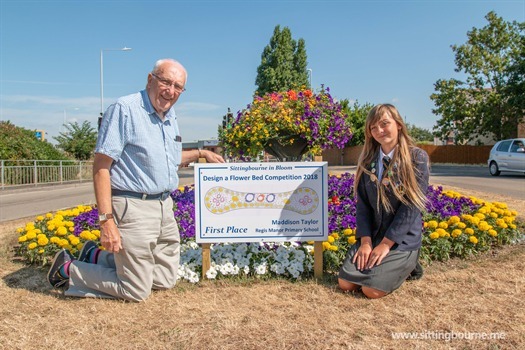 For the past fourteen years, the Sittingbourne in Bloom committee has organised an annual competition to allow school children to design a landscape feature in the town. “Last years design by Francesca Bandalac, also a student at Regis Manor Primary School, won the accolade from South and South East in Bloom of the Best Floral Feature in the whole Region and helped Sittingbourne to get a Gold Award in the Large Town category of the annual Regional Competition." "We hope that Maddison’s design will be just as successful this year”.